Part 3 of our DRY SKIN GUIDE to why we have dry skin and easy ways to make your skin soft and clear. 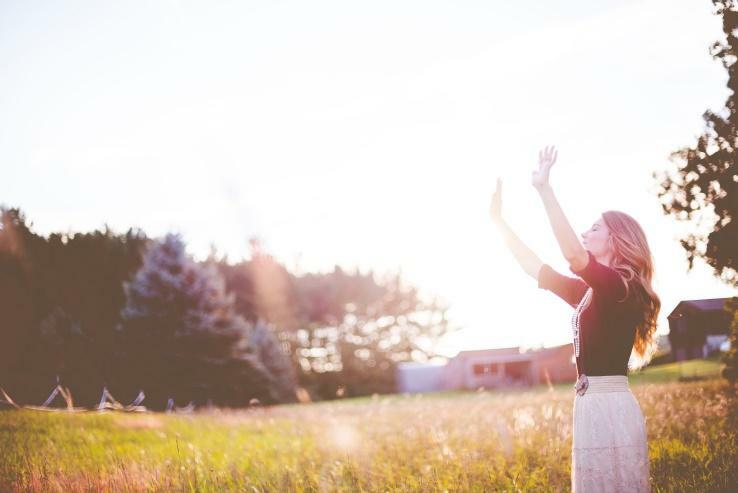 As the weather gets warmer and the days longer our clothes tend to get shorter and cover less; we want to start baring our arms and our legs to the sunshine! Through winter we tend to stay in, turn on warm heaters, have hotter showers, cover up and eat foods fitting to the weather. These foods tend to be higher in fats, proteins and are heavier in density like thick soups, casseroles or denser carbohydrates. In winter, it’s likely we haven’t been out exercising as much either so come springtime, our bodies may be feeling a little sluggish. When I was training to become a Naturopath I was sitting in a 2nd-year anatomy lecture and had started studying the lymphatic system, it is a large topic for Naturopaths. We spend time every year through our degree going deeper and deeper into its workings as we see it as an integral part of our immune & elimination systems for our bodies. It’s absolutely fascinating! It was in one of the first lectures that I felt this tingle down my spine as I was so intrigued at what this was and knew I had to know more. I went searching and eventually found the answers I needed and that was through Lymphatic Drainage. Let me introduce you to the Lymphatic System (LS). The lymphatic system is our waste system. For example, if you put your thumb on the bottom of your wrist and forefinger on the top of your wrist the space between our thumb and forefinger is called the interstitial space. These interstitial spaces in our body house everything. All of our organs, bones, cells etc and every minute thing are happening in that space, there is cleanup happening all the time. Cells are dying, bugs are being destroyed, nutrients are being transported to areas they’re needed as well as fats and large proteins being removed. This all sits in fluid and this fluid needs to be filtered. The lymphatic system is that filter system. It is now known that all fluids within the interstitial space are transported through the lymphatic system and filtered through at least 2 lymph nodes before being put back into circulation or excreted from the body. One of the things the lymphatic system struggles with is saturated or heavy fats as it is hard to filter and slows the system down. Primarily the lymphatic system is very lazy and if it gets overwhelmed, it tends to go slower or struggle to push fluid through. So imagine in winter when we’re not exercising as much and eating foods higher in fats and proteins. It’s no wonder the lymphatic system gets sluggish, just think of it like blocked drain pipe; it backs up and goes nowhere. Spring is a time for nutrient-dense foods to replenish the vitamins, minerals and good fats we need to build strength. But in our modern times, we tend to overindulge in the winter months, instead of more of a starvation period like our ancestors, we eat or drink too much but often nutrient empty foods during the cooler months. Start to eat lighter cleaner foods. Fill your plate or cup with green vegetables – Green leafy vegetables or green smoothies are good foods for the liver. While I don’t like the term to alkalise, (too alkaline is as bad for us as to acid) these foods help bring our pH back into a suitable balance so our bodies can self-heal better. Good fluids – Filtered water, herbal teas, hot lemon water, self-carbonated water. Unclogging the pores – Saunas, steam rooms and sweat lodges. Exercising – Walking, swimming, bike riding, rebounding, sport or whatever takes your fancy and gets you active and out of the house or office. Practicing deep breathing to clean out our lungs. Exfoliating to remove dead skin cells. Stimulate the lymphatic system by dry brushing. Dry body brushing helps you achieve glowing, smoother skin. 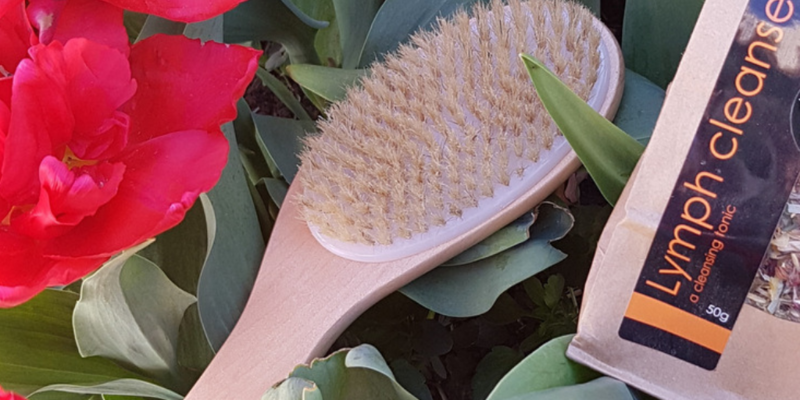 Your skin is your largest organ and dry body brushing removes the dead skin cells which allows the body to release toxins a lot more efficiently. It increases blood circulation and stimulates the lymphatic system. A dry body brush is a little is like a scrubbing brush you use in the shower, but the bristles are nice and soft. The best body brushes are made with natural fibres and you use the brush prior to showering while skin is still dry. A brush with a handle is better than a mitt or loofah or such as you can reach further areas like your back or your feet if you struggle to get down that far. As the lymphatic system sits just 2-8mm under the skin, don’t use a brush with hard bristles, this may squash the skin and hurt more. I recommend opting for a dry brush with a soft bristle. Except for the deep lymphatics of the gut – things like yoga and deep breathing is good for stimulating the deep nodes – dry body brushing helps move fluid up to the neck which is where it drains. Change hands and do the same on the other arm. Then sweep from the waist up and short strokes upwards moving across your tummy, armpits, breasts to the neck. Then put your arm around to your back and sweep either up or sidewards whichever you can manage. Next do the same starting from your knees to your waist, doing short strokes up your legs inner thigh both front and back and over the buttocks. Do the same sweeping from feet to knees front and back and then finish by sweeping from knee to waist then waist to neck. You then hop in your normal shower or bath and feel your skin tingle. Showering afterwards helps to wash away dead skin cells but also helps to stimulate the lymphatic system. Cleavers – A good old sticky weed. Yes, it’s the weed that sticks to you and is thankfully easy to pull out from the garden. Calendula – A lovely lymphatic especially to the lower half of the body by stimulating circulation. Echinacea flowers and leaf – By activating macrophages which are grown in the lymphatic system, I call them the body’s army defense system. Dandelion leaf – A wonderful diuretic high in nutrients especially potassium. Astragalis – Used for chronic immune depletion. Horse chestnut – A wonderful lymphatic for the legs or preferably lower half of body – best in a tablet/capsule or tincture. Lemon Grass – For immunity and fluid retention. Red Clover – Not technically a lymphatic herb but beautiful for achieving skin that glows. Quercetin, Nutritional Ascorbic acid or Rutin – All of these can be found in nutritional tablets or a good quality vitamin C mix. So take charge this spring and help your body out of the post-winter doldrums!